Used Car Dealership Sales OffLeaseOnly Ranks #2 Nationally! OffLeaseOnly Ranked #2 in Nation! Used car giant OffLeaseOnly continues to be a dominating force in the industry, capturing second place for independent used car dealership sales, according to a survey conducted by Auto Remarketing Magazine. Auto Remarketing ranked OffLeaseOnly based on the highest sales of a SINGLE used car dealership location, when OffLeaseOnly operations are spread across several different sites. OffLeaseOnly Orlando was not included because it didn’t open for business until November 2014 and the rankings were based on 2014 sales. 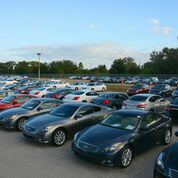 OffLeaseOnly Used Cars line an OffLeaseOnly used car lot. Had the sales figures from OffLeaseOnly Palm Beach and OffLeaseOnly Miami dealership locations been combined, OffLeaseOnly would have ranked No. 1. OffLeaseOnly figures will be even more impressive next year when sales figures from Off Lease Only Orlando are included in the mix. “Unlike the massive used car dealership chains, OffLeaseOnly is an independent chain,” said OffLeaseOnly Chief Operating Officer John Giasullo. “Each one of our OffLeaseOnly used car dealership stores sells three to five times as many cars as the nearest chain store location in any particular area. 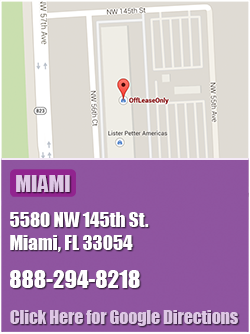 OffLeaseOnly operates stores in Palm Beach, Lake Worth, Miami and Orlando and typically sells nearly 3,000 OffLeaseOnly used cars a month at the locations combined. In fact, the month of July looks like it’s going to finish as an all time record of over 3,100 cars and owner Mark Fischer could not be more proud of his incredible team! “As our out of State business continues to grow, even more people Nationwide will flock to Off Lease Only. It’s amazing to think my wife and I started this company with just two cars and to date are about to help our 100,000th customer save thousands on their dream car,” Fischer said. Eileen and Mark Fischer, OffLeaseOnly owners. Used car buyers purchased 8,408 OffLeaseOnly used cars in the first quarter of 2015 and 22,418 OffLeaseOnly used cars in 2014, according to OffLeaseOnly accounting statistics provided by Chief Financial Officer Richard Burstyn. OffLeaseOnly’s 2015 sales total an astounding 16,448 cars as of June 30th! That’s a lot of cars. 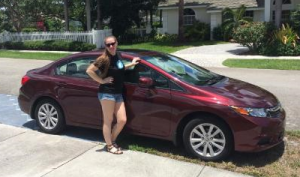 OffLeaseOnly Used Honda Civic Owner Sarah Van Duys received her used car for graduation. Used car buyers flock to OffLeaseOnly used car dealership stores because they love OffLeaseOnly’s business policies of no haggling over price, no high pressure sales and complimentary Carfax reports for every used car that is sold, Giasullo said. Used car shoppers also love OffLeaseOnly’s policy of allowing customers to take a vehicle for a test drive without any OffLeaseOnly sales personnel in the car. Did you know that at Off Lease Only you can even take your used car of choice to the mechanic you choose for a thorough inspection prior to your purchase? 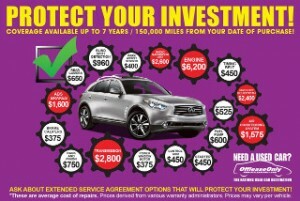 Off Lease Only also offers extended service agreements available for up to 7 years and 150,000 miles from your date of purchase. Any unused portion of this service agreement is also refundable and/or transferable in the event you sell your car. It’s all about the customer having peace of mind at Off Lease Only and a stress free experience. 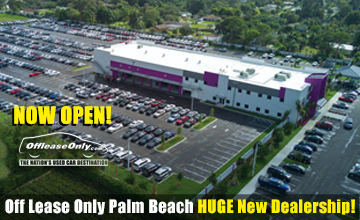 And because the OffLeaseOnly business model is so successful, OffLeaseOnly’s presence in Florida continues to grow. OffLeaseOnly opened a magnificent new used car dealership near the Orlando International Airport last November and sold 45 used cars the first day the doors were open for business. There are talks of additional used car dealership stores opening before the end of 2015. The demand is there and the selection of nearly new quality used cars is second to none! The amount of loyal repeat customers in Central Florida is no surprise to Fischer. “These customers have been making the trip to Lake Worth and even Miami for years- I am so happy and proud to help make buying a quality used car from Off Lease Only more convenient for my customers in the Central Florida area,” Fischer says. 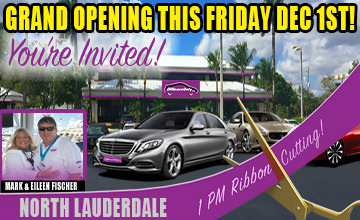 OffLeaseOnly’s Palm Beach dealership does so much business it has outgrown its home at 3531 Lake Worth Road and will be expanding soon into a huge new used car dealership at 1200 S. Congress Avenue. Construction of the new facility began on July 21st. 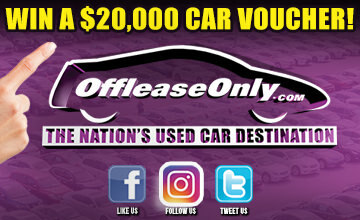 OffLeaseOnly knows that great cars and great customer service are what keep loyal customers coming back and continues to offer an ever-growing inventory of nearly new used cars priced thousands below retail. OffLeaseOnly recently had its first 2016 Hyundai Elantra for sale with just 855 miles on the website. With inventory like that, customers really can see why it makes sense to save thousands buying a quality low mileage pre-owned car from Off Lease Only. “Our growth comes from our customers. Once they take delivery of their car and realize it was a $6,000 savings, and there was no haggling on the price and no hidden fees, they quickly becomes soldiers of OffLeaseOnly,” Giasullo said. OffLeaseOnly management also pays close attention to every review that is filed online on review sites such as DealerRater, Google+, Yelp, CarGurus, Edmunds, BetterBusinessBureau, ConsumerAffairs and Cars.com. Hundreds of customer reviews stream in weekly and OffLeaseOnly’s team personally responds to every single one. OffLeaseOnly is proud to provide a unique car buying experience and change the way customers purchase their next vehicle. Our mission statement is to dominate the market Nationwide by providing a unique car buying experience free of hidden fees, negotiating and stress with an emphasis on customer service before, during and after the sale. OffLeaseOnly this year also earned national recognition for its incredible customer service from DealerRater and Edmunds, with the highly-coveted DealerRater of the Year Award and Edmunds Five Star Dealer Award based on customer satisfaction and customer reviews. 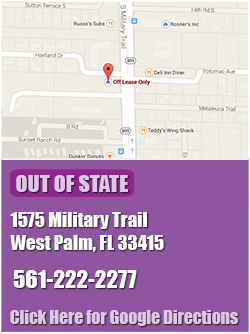 Off Lease Only’s primary goal is customer satisfaction! 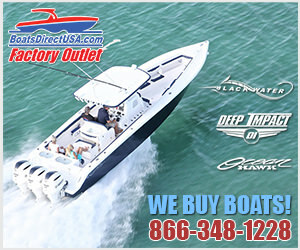 Read thousands of customer reviews on the OffLeaseOnly Reviews Site! The OffLeaseOnly review site aggregates reviews from Yelp, Google, Edmunds, Cars.com, DealerRater and Better Business Bureau in one convenient location. At the end of the day, don’t take it from us, read our OffleaseOnly customer reviews and see why Off Lease Only is the Nation’s Used Car Destination! Stop in to one of four Off Lease Only locations today and drive home your dream car! 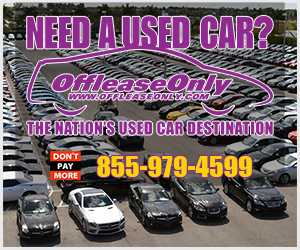 ← Previous Story Hard to Find Used Audi Models at OffLeaseOnly for Less!